Photos by Keith Alstrin and Takashi Sato GCU News Bureau In addition to the Alumni Hall of Fame ceremony and a dinner in the inductees’ honor, homecoming weekend at Grand Canyon University featured the first alumni golf tournament and brunch at the newly renovated GCU Championship Golf Course, a soapbox derby and, of course, a basketball game, complete with the alumni tailgate and the announcement of the homecoming court. Chapel will be extra important Monday because the speaker will be Dr. John Lennox, an Oxford professor who is one of the leaders of the discussion about Christianity’s place in science. In addition to his presentation at Chapel, Lennox also will speak at 2 p.m. in the Arena in a session that will be open to the public. This week’s edition of Antelope Intros features two main campus employees who like to seek exciting opportunities and cherish family. GCU’s Innovative Computing Club is about a year old, but this month club members are completing a compassion mission they began almost as soon as the club was formed. They acquired and assembled 100 fully equipped desktops — complete with monitors, keyboards and mice — to four Arizona organizations that help disadvantaged community members. GCU President Mueller, who has made it a priority to expand STEM programs and enrollment at GCU to help build a highly trained workforce, was honored at the IEEE’s annual banquet Saturday at the Hilton Phoenix Airport. This week’s edition of Antelope Intros features two Tempe enrollment counselors who share a passion for sports and family. And one of them was right in the middle of the day none of us will ever forget. Arthur Miller’s powerful, yet simple storytelling comes to life on the Ethington Theatre stage at GCU this month, with six performances of “All My Sons.” Written in 1947 by the playwright, who has the notable distinctions of receiving the Pulitzer Prize for Drama and being married to Marilyn Monroe, “All My Sons” reportedly was Miller’s last stab at writing a commercially successful play. Failing that, he would go do something else. He did not need to, and you’ll see why in the College of Fine Arts and Production’s stellar performance. If you saw “Scapin,” the College of Fine Arts and Production’s October performance in Ethington Theatre, you will not be surprised to learn its director and some of its cast and crew members are competing in a prestigious regional festival this weekend. 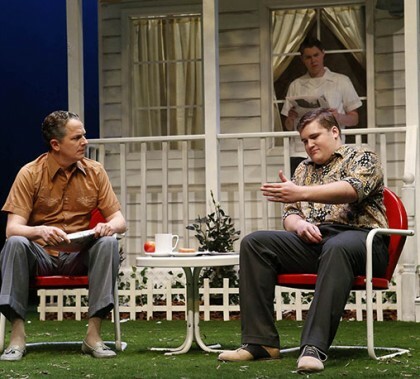 GCU will be represented at the Kennedy Center American College Theater Festival in Hawaii by instructor Michael Kary and seven students who played big roles in the enormously impressive and hilarious play.